As I was trying to paint the outside of the house in the howling wind today, my mind wandered back, as it does when the body is involved in mind numbing activities, to the trials of camping in the wind. 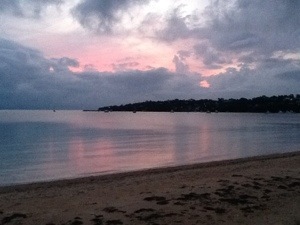 One particular event that came to mind was an evening in the delightful hamlet of Waratah in the Northwest of Tasmania. We arrived and the air was still. I pitched the tent but being lazy and seeing that the wind was absent I thought I would dispense with the extra guy ropes. We slept well for most of that night until a Bass Strait gale decided to descend at about 5:30 a.m. We were shocked into alertness when the staves of the tent started bending inwards at an alarming angle and the tent thought it was a plane on a runway preparing for take off. Scrambling out of our sleeping bags, my wife and I tried to get dressed but we had to do so with our posteriors pushed against the bucking and bending staves to stop them from snapping. After having made ourselves presentable for the outside world under extreme circumstances, we packed our gear and started dismantling the tent. But I was too eager in my removal of the pegs with the consequence that the tent then decided it wanted to fly to Antarctica. In desperation I picked up the nearest weighty object at hand and threw it on the flailing tent – this happened to be the love of my life. While she was spread-eagled on the angry tent I tried to roll it up underneath her. Surprisingly, I accomplished this, and kept the marriage intact – which was good, as we still had many hours together in the car to manage that day. Moral: In the future prepare for the worst and hope for the best. If you are like me, you are quick to complain when things go wrong. I don’t always vocalise these grumbles but God must be only too aware of my grumbling heart. 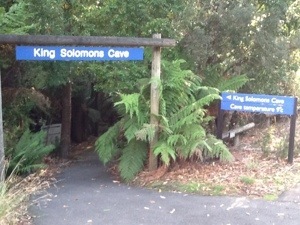 God’s eternal care really came home to me on our recent trip to Tasmania. God reminded me that He takes care of me all the time. Even when I am oblivious. I am always “in his grip” (as a fellow blogger describes himself). After a strenuous hike my wife and I pitched our hiking tent in, what seemed at the time, a suitable location. We slept there that night. At one point in the middle of the night I left the tent to take care of “necessities”. The following morning as my wife was making breakfast I packed up the tent. A short while later a fellow hiker, whom we had met a day earlier, passed through and said “Hi”. After a chat she continued on her way. A few seconds later we heard a scream. We jumped up and ran to find out what was going on. Our hiker friend had spied a black snake. When she described where it had come from and where it had gone she pointed to where we had pitched our tent that night as its place of origin. As danger lurked around us we were ignorant. On how many other occasions in my life has that happened? I only grumble about the problems and struggles that I see, but how much more should my life be a hymn of praise for all the blessings, protection and care that God bestows moment by moment! Anybody who knows me is aware of my passion for well presented local museums. The culture of our communities needs to be preserved for generations to come even if they may be unaware of that at this moment. Too often we lose our history and are aware, too late, that we can’t retrieve it. My own city of Geelong is very slow in learning that lesson. 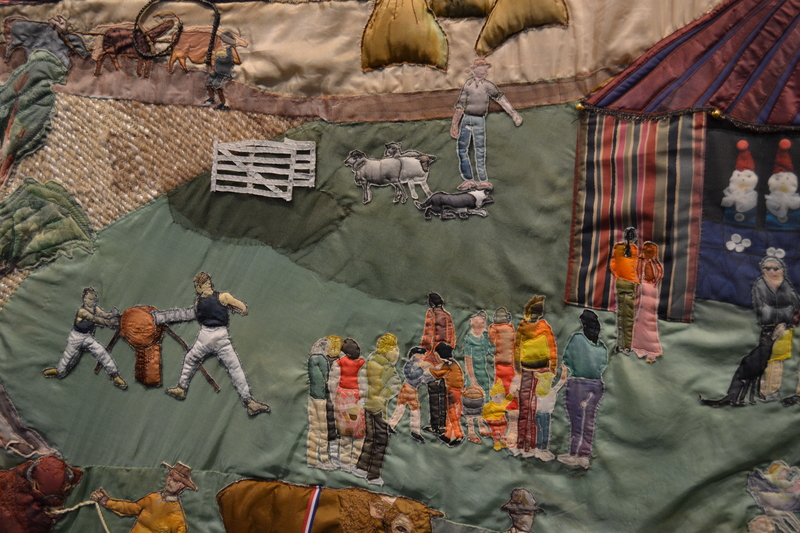 A detail from one of the panels: Wood cutting and sheep dog trials at the local show are presented. The first – Yarns Artwork in Silk tells the story of Deloraine and district in 4 giant silk embroidered and patch-worked panels. The panels cover the four seasons of a year in a purpose built auditorium. A professional overview is presented of the panels and their creation. 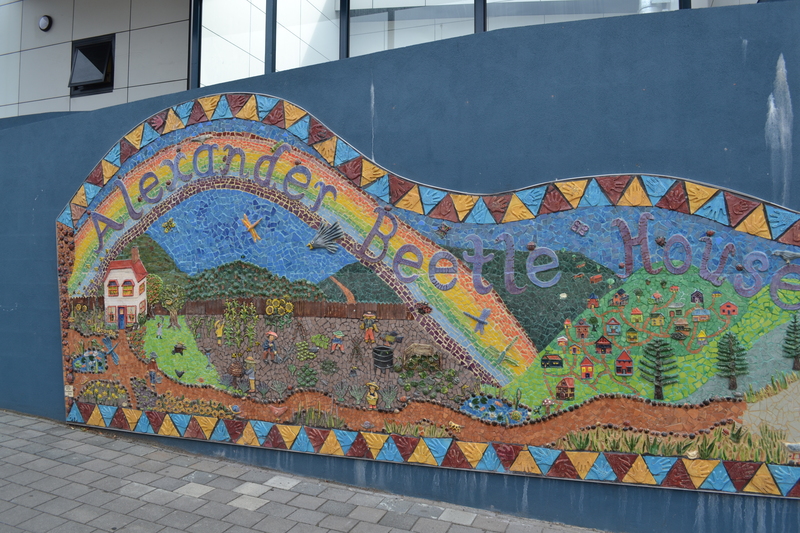 The artistry, craftwork and community involved in bringing these panels to life is impressive. 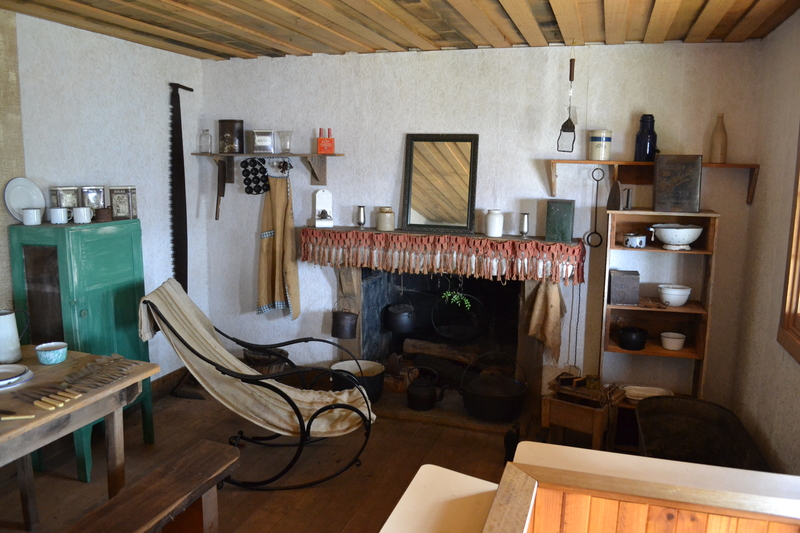 The second: The Deloraine and Districts Folk Museum reflects the people, life and industries of Deloraine’s past. There are tableaus set up in the museum building, which is actually one the town’s historical buildings. In the grounds there are other buildings, sheds and bush huts, as well as farm machinery and transport that speak to us from the past. The aspect that impressed me most was that the work is immaculately curated. It is not simply thrown together in some unholy muddle as you find in some museums. While we were there keen volunteers came in to maintain the gardens and grounds and were enthusiastic about their museum. Their attitude was one of pride in a local treasure. I believe both aspects of the museum need to be promoted more vigorously. We only came across it by accident. If you are in this area on your travels a visit is a must. We sometimes fail to see beauty in our own backyard. Many Australians who have thought about going to Uluru or the Barrier Reef have not even thought about Freycinet. 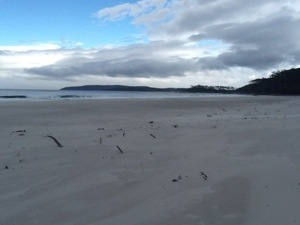 Yet the Freycinet Peninsula is a spectacular piece of Tasmanian scenery and geography. It can stand proud when matched with world famous sights. The geography is majestic, the walks are breathtaking and the camping spots rank in our top 5 favourites. The tent pitches are neatly set out and each had its own private access to the beach. Each pitch is separated from the next by natural vegetation. As another camper was walking by, I hear him say to his wife, “this is as close as it gets to Paradise.” High praise indeed! 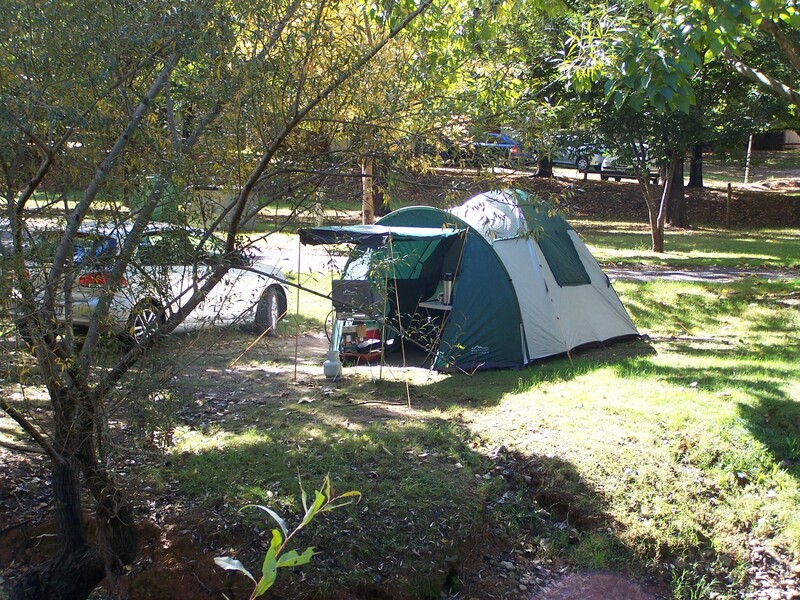 Even better, it is one of the few places we have encountered where the tent sites are superior to the caravan, camper and RV places. The walks are great. Yesterday we did a circuit of 12kms. This included a walk to a lookout over Wineglass Bay, then down to the Wineglass Bay beach, across the isthmus, along the Hazards beach and finally a scramble over red granite boulders for a few Kms. We rewarded ourselves with ice cream and a can of soft drink. We are heading north towards the boat. While traveling past a church I noticed a crop seeder out the front. I thought to myself, what a wonderful symbol for a church, but ironically the church had closed down. Currently I am sitting in the car while Hetty is exploring King Solomon’s cave. It is amazing what you find in Tassie. The place names also give us a clue that he was down here 3000 years ago. There is the Jordan River, the Nile, Jericho, Bagdad, Jerusalem (now Colebrook) and others. It only goes to prove how far you can get on a camel! As I wrote earlier, it was impossible this morning to find a place to worship, but this was not the case for all our fellow campers. The campsite was full of followers of other gods: Holden and Ford. Their worship was up the road at Symmons Plains where the V8s meet. Their incense would be the smell of petrol and burnt rubber. The followers, dressed up in their finery of jackets and caps heralding their faith, and with flags flying, left the camp ground with evangelical zeal and sallied north. We on the other hand went south and discovered two amazing treasures. In Colebrook, formerly Jerusalem, the RC church was designed by Sir Augustus Pugin. It is a simple gothic building of sandstone, oak and pine. 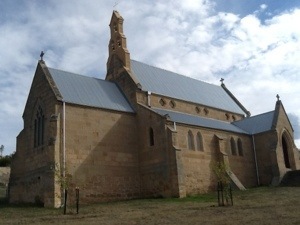 Pugin who designed many of Britain’s important buildings in the C19th in the neo gothic style had time to design a number of churches in NSW and Tasmania. It seems that the Bishop in the new colonies was a mate of his. 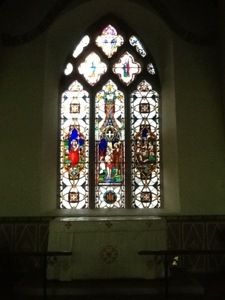 In another, even smaller town, Buckland, the Anglican Church has a beautiful stained glass window that reputedly comes from Battle Abbey near Hastings in the UK. The provenance is quite strong. 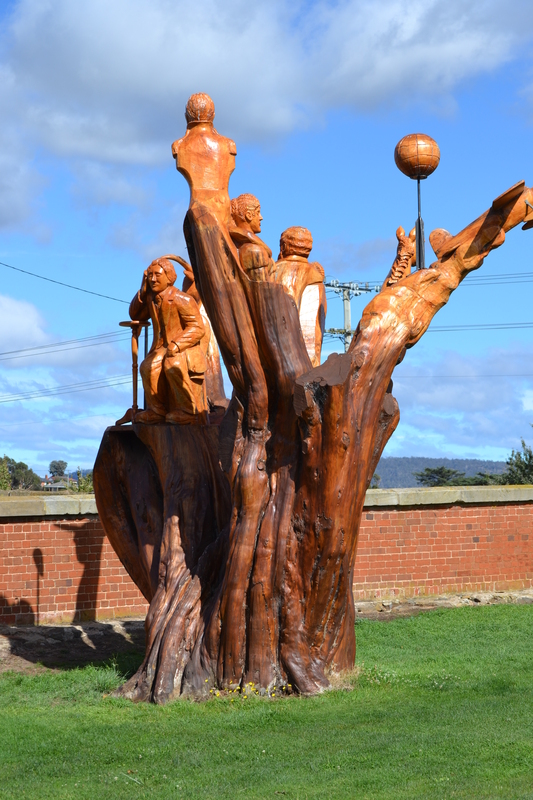 These are just two examples of numerous treasures in small Tasmanian towns. 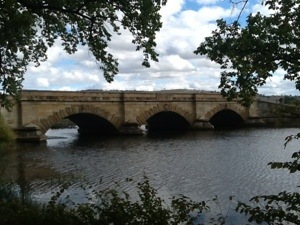 I have mentioned the Ross bridge, but there are also amazing convict built bridges in Campbell Town and Richmond. There are Georgian sandstone houses, small settler dwellings and buildings such as barracks and government offices converted to other uses. Towns such as Oatlands, Ross and Richmond have main streets that hearken back to the colonial era. For anyone who likes history and scenery it is hard to bypass Tasmania. 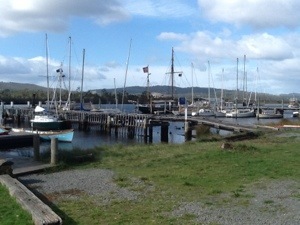 Currently we are camped in my favourite Tassie hamlet – Ross. It is my favourite for a variety of reasons. In 1966 when I was a callow youth, the bus from Launceston stopped at the C19th pub to allow for mid journey refreshments, so it brings back memories. Ross is crammed with history. Various British regiments were based here in the first half of the C19th. The barracks, bridge, pubs, churches and many houses go back to that period. 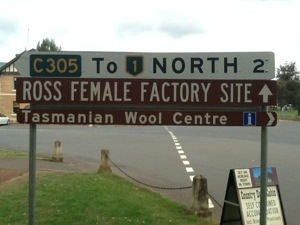 The ghosts of convicts still haunt the place through the buildings and even the sites of past buildings like the unusually named, “Female Factory” where convict women were put to work. Ross is not the only town like this, in fact there are a number like it, such as Richmond and Campbell Town to mention two. 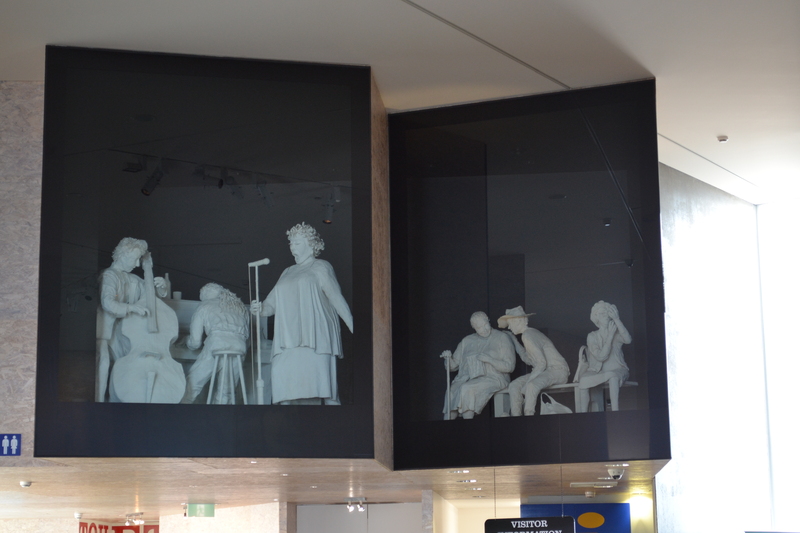 Here you do not have to scratch very deep to see Australia’s convict past. On this trip we purposely haven’t stopped at Port Arthur because we wanted to explore the many other rich veins of history in Tasmania. I have often written about the slow death of Christian culture. It is, sadly, no different in Tasmania. Looking for a church in which to worship this Sunday was impossible. Three beautiful churches – but none were rostered to have a service this Sunday. There was a time, not even that long ago, that these institutions were one of the centres of country living. In Ross at the main intersection in town the four key buildings were a church, town hall, pub and prison – Salvation, Recreation, Temptation and Damnation. Now only the Temptation is open all the time. 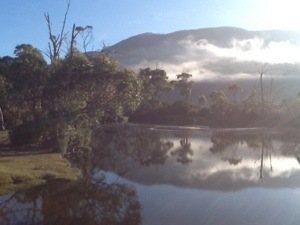 We camped overnight at Narcissus Bay. The views are stunning: lake, mountains, majestic trees and friendly wildlife. The Pademelons were quite inquisitive There was only one other person there. In the morning after we had packed up our hiking tent one of the incoming hikers found a black snake sunning itself close to where had slept for the night. At least we got a good night’s sleep – in sweet ignorance. We took the ferry back to the Visitors’ Centre. What took us 7 hours to walk was only a 40 minute boat trip back. 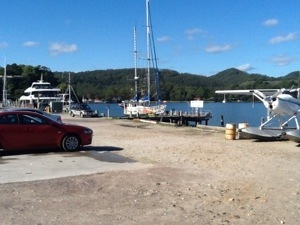 We then drove to Strahan via Queenstown. Today has been a recuperation and clothes washing day. This will enable us to be near each other and not choke. 1. Tasmanians seem intent on dragging boats from one end of the island to the other. And if they are not pulling a “tinnie” they are hauling a load of firewood. 2. In the future Tasmania will sink by some metres due to the weight of all the camper vans in the state. 3. The amount of road kill is quite staggering. In some places we counted up to half a dozen Pademelons, Possums or Tasmanian Devils in a kilometre stretch. 4. The Roads’ Department could save thousands of dollars not putting up “Winding Roads” signs. That is a given for every Taswegian, and for overseas arrivals they need only one sign as you get off the boat in Devonport. 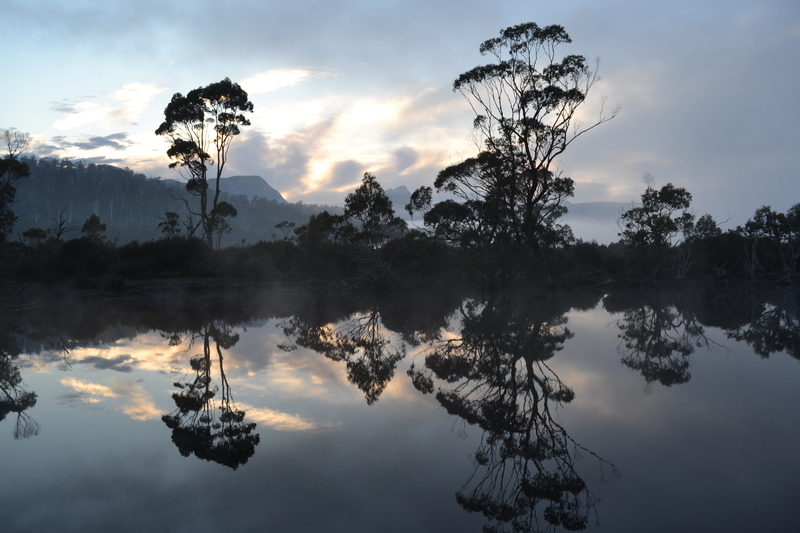 If you like walking/hiking, Tassie is the place to be. Yesterday we started to trek to Cape Raoul but after 2 hours of walking over boulders our ankles and knees had had enough. We had to turn back but not after having seen spectacular rugged coastline. At every turn it is hard not to give God praise for His wonderful creation. Tassie must be His poster state! Today, being suckers for punishment, we trekked from the Lake St Clair visitors’ centre to Narcissus Bay- over 16 Kms of walking through densely treed forest with giant roots to trip you up at every step. Interspersed every 500 metres was a muddy creek to cross. I’m sure for seasoned hikers this was a doddle but we found it challenging. Tonight we are in our hikers tent. The last time I can remember using it was in Sweden last year. This is another reason to be thankful – the privilege of seeing so much. And we are amazed we have arrived dry and without any broken bones but oh so sore! When we got up this morning the sky was dull but we had enjoyed a very restful night in the stillness of the Tahune forest. It is a bit like being locked in a Zoo at night. There were only a few campers in this vast forest. We drove to Ida Bay south of Southport where we caught a tiny train originally used for mining. It runs on a 2 foot gauge so comfort is not a consideration. However, it is unique! At the end of the line we walked for over one and a half hours to the Southport Bluff Beach. We traversed button grass plains, scrub, forest and dunes. At the bluff there was a magnificent panorama of the Hartz mountains to the west and the southern end of Bruny Island and the coast to the east. We had lunch and trudged back to the train. Tonight we are in Dover. Apart from someone firing a shotgun in the distance all is very quiet. We left Dover and drove along the coast road to Geeveston. This drive along a spectacular coastline reveals wonderful vistas of southern Tasmania. It is not highlighted on any tourist map that I have seen. Maybe the locals want to keep it this way. After a visit to the Geeveston Forest Centre which promotes the idea of balance between wood use and forest conservation, we went to the Wooden Boat Centre in Franklin. This little enterprise trains people in building wooden boats. People come from all over Australia and the world to do this course. The Centre’s aim is to pass down old skills as well as preserving heritage boats. As a Christian I found it intriguing to listen to the evangelical zeal the man who showed us around the boat shed, had for his mission in life. I quietly wished that Christians would have the same enthusiasm about their own faith. This man’s love and passion for wooden boats was unmistakable. 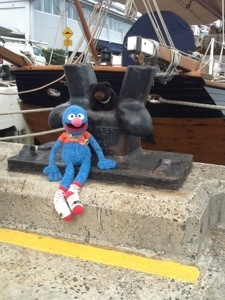 We then headed through Hobart and travelled to the Tasman peninsula. The devastating effects of the recent bush fires was plain to see. It is sobering to think that the same rugged beauty of the bush can turn into ugliness very quickly. Rebuilding and focused energy on the task of re-establishing homes and businesses was evident. 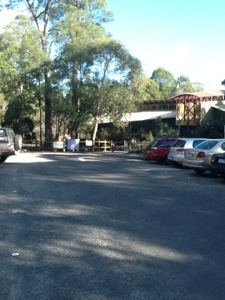 Tonight we are camped in a National Parks campsite at Fortescue Bay. The camp s primitive but the locale sublime. 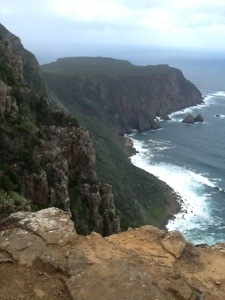 Tomorrow we plan a walk to Cape Raoul.